The OECD works with various governments and international and regional organisations in Sub-Saharan Africa to promote social and economic progress and policy dialogue in support of Africa’s domestic and regional reform agendas. The OECD’s work with the region addresses a broad range of policy issues, including structural reform, trade and investment integration, business climate, competition policy, infrastructure development, domestic resource mobilization, the fight against tax evasion, public debt management, budget reform, public governance, the fight against bribery, state-owned enterprise reform, sustainable development and green growth, food security, gender equality, statistical capacity building, innovation, education and skills development, and development co-operation. South Africa, one of the OECD’s five Key Partners, has taken a leading role in many of these activities. Below is a list of the OECD’s main partnerships and initiatives with Sub-Saharan Africa. Additional information on our work with the region can be found in our Active with Africa brochure. As the centre of gravity of the global economy shifts east- and southward, the OECD Development Centre helps policy makers, investors and activists better understand the opportunities and risks faced by the African continent. The Centre, established in 1961, includes 4 members from Sub-Saharan Africa: South Africa, Senegal, Cap Verde and Mauritius. At the core of its Africa programme is the African Economic Outlook, a unique annual report produced by the OECD Development Centre, AfDB, UNECA and the UNDP Bureau for Africa that monitors the economic performance and prospects of 54 African economies, analyses the key successes and challenges faced by these countries and provides innovative policy advice. The results of the Outlook are regularly debated publicly at the International Economic Forum on Africa in Paris, as well as at several events in Sub-Saharan Africa and around the world. For an overview of the OECD’s development co-operation work with Sub-Saharan Africa, click here. Multi-Dimensional Country Reviews (MDCRs) are a tool adapted to the realities of emerging and developing countries, supporting them in their efforts towards sustainable development. National governments request MDCRs in order to identify cross-cutting issues that hinder their country’s development as well as receive concrete policy recommendations to address these constraints. MDCRs mobilise expertise from across the OECD and target it to each country’s specific needs. MDCRs have applied a number of OECD tools to African countries, including the OECD framework for measuring well-being and progress or the OECD Inclusive Growth Framework. MDCRs in the region are also contributing to the development of a holistic view of development and providing support for approaches where different parts of the administration work together towards common goals. Founded in 1976 as the “Club du Sahel” in response to the drought crises in the region, the Club’s mission is to promote the development and integration of the West Africa region. Members include three West African regional organisations (ECOWAS, UEMOA, CILSS) and 7 of their development partners. The SWAC Secretariat, based at the OECD, monitors and analyses regional political, economic, and social trends; supports West African organisations in formulating and implementing regional policies; devises strategic guidelines and policy tools; and promotes West African positions and policies in global debates and initiatives. SWAC supports policy dialogue at the regional level notably through the Food Crisis Prevention Network (RPCA), an international platform for joint analysis and concerted action in the fight against food and nutrition insecurity. The SWAC Secretariat also facilitates dialogue and advocacy for the Global Alliance for Resilience (AGIR), a unifying framework, whose objective is to promote greater resilience to hunger and malnutrition among vulnerable populations. Launched in 2006 as a partnership between the OECD and NEPAD, the Initiative aims to strengthen the capacity of African countries to design and implement reforms that improve their business climate. It also works to raise the profile of Africa as an investment destination while facilitating regional co-operation and highlighting the African perspective in international dialogue on investment policies. It is chaired by the NEPAD CEO, with South Africa and Japan as Vice-Chairs. It currently actively works with around 20 African countries. The Initiative facilitates high-level dialogue among African policy makers, conducts investment policy reviews of selected African countries, develops regional investment policy frameworks (e.g., with the Southern African Development Community), conducts thematic analytical work and studies (e.g., on private sector participation in infrastructure development), and supports capacity-building activities (e.g., training for designing and implementing public-private partnerships in infrastructure development). In December 2008, the OECD and the AfDB launched a partnership to support African governments in their efforts to fight bribery and corruption. Working with African policy makers, businesses, regional and international organisations, the Joint OECD/AfDB Initiative also aims to boost private-sector competitiveness by promoting standards of corporate integrity and accountability. These policies and standards are grounded in the provisions of the African Union Convention on Preventing and Combating Corruption, the UN Convention Against Corruption, and the OECD Convention on Combating Bribery of Foreign Public Officials. In 2011, the Initiative's member countries adopted the Anti-Bribery and Business Integrity Course of Action for Africa which outlines necessary steps for countries’ anti-bribery and business integrity efforts. Most recently in 2016, the Initiative published the Anti-Bribery Policy and Compliance Guidance for African Companies. 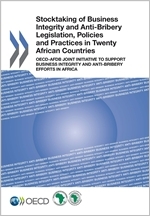 Developed by anti-bribery experts at both the OECD and the AfDB, this new guidance will help African companies of all sizes set up measures to prevent bribery and improve the quality of corporate compliance and anti-bribery policies. The OECD Tax Global Relations Programme, in collaboration with ATAF, has delivered over 20 tax-related technical training, benefitting hundreds of African participants since 2010. In addition, the OECD Task Force on Tax and Development has supported the ATAF capacity building programme via bilateral technical assistance with several African countries on different fields such as state-building and capacity development, and with a focus on effective transfer pricing regimes and countering base erosion and profit shifting including increased transparency of financial reporting by multinational enterprises. The Global Forum on Transparency and Exchange of Information for Tax Purposes, in which 25 African countries are members have a developed a specific Africa Initiative to enhance transparency and exchange of information to combat cross-border tax evasion. It works closely with ATAF in delivering technical assistance throughout Africa. The OECD Competition Division supports, together with the World Bank, UNCTAD, the EU, SADC and CUTS the African Competition Forum (ACF). The ACF, established in 2011, is made up of 34 operational competition authorities and regional competition agencies. The Forum aims to promote the adoption of competition principles in national and regional economic policies; assist in building the capacities of agencies in the region; and promote awareness and appreciation of competition principles amongst government and other stakeholders. The OECD provides advice and training based on its Competition Assessment Toolkit and the Guidelines for Fighting Bid-Rigging in Public Procurement.